Carroll Shelby will forever be linked to the Ford Motor Company. But, did you know he had his own Ford dealership in the 1960s? 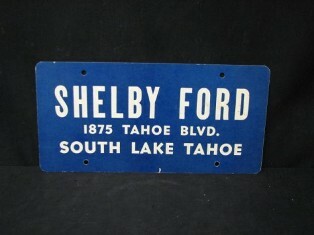 Shelby Ford was located on the south shore of Lake Tahoe in the state of California. The dealership was located near one of Carroll's homes. Any story about the dealership will probably be short and sweet, as he only sold two 1968 Shelbys. The white, fastback is # 4430. 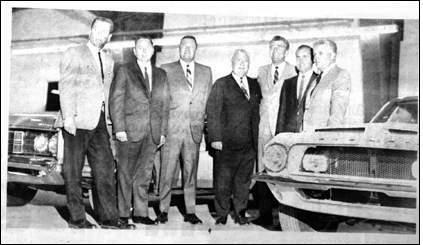 Shelby poses with Ford executives inside the dealership. Shelby is third from the right. Pictures courtesy of the Lake Tahoe Newspaper. The other car was # 3898. It was a red convertible GT 500KR. Most likely the one shown in the picture above. Bill found this cardboard plate.